Earlier in the week I spoke about how the abundance of refurbishments took something away from the Disneyland experience. While I stand firm on the point that having that many iconic attractions closed at one time is bad for the guest experience, there was one thing I noticed as part of Disneyland’s refurbishments that I’ve never seen at Walt Disney World, a sense of history. Walls were up around both the Matterhorn and Sleeping Beauty Castle, with the castle also receiving a scrim treatment, in addition to other areas. At these two wienies, however, there was something else present. At the castle there were a set of two panels and at the Matterhorn a set of four panels detailing the history of the attractions. Little details, hidden gems, and stories that were straight out of the Disneyland history books that the average guest may not know. My first thought was that with so much history, it’s no wonder they choose to plaster it right up on the walls during a refurbishment. As I chewed on this thought a bit longer, it occurred to me that there is only sixteen years between the openings of Disneyland and Walt Disney World. The Magic Kingdom does a wonderful job of paying homage to its history in the attractions, such as the Nautilus in the rockwork of Under the Sea or Mr. Toad handing over his deed in The Many Adventures of Winnie the Pooh, but there isn’t anything that comes right out and addresses the history. When New Fantasyland was being constructed, in particular the Seven Dwarfs Mine Train, the windows into the construction were great, but why not have panels talking about all of the attractions that have occupied that spot of land? Talk about the submarines, Birthdayland, Toontown, Winnie the Pooh’s playground, and the monumental effort it took to keep the tree structure and move it across the way. There is a lot of history there to address, and no one putting it out there to educate guests. I love that there are differences between Disneyland and Walt Disney World, it gives us something to compare and contrast, to have informed discussions about, and to make up our own minds on. On this point, however, there is no question that Disneyland has gotten it dead right. The name Disney is synonymous with edutainment, and by not addressing its own history when given the perfect opportunity to do so, Walt Disney World is missing out on an extraordinary opportunity. 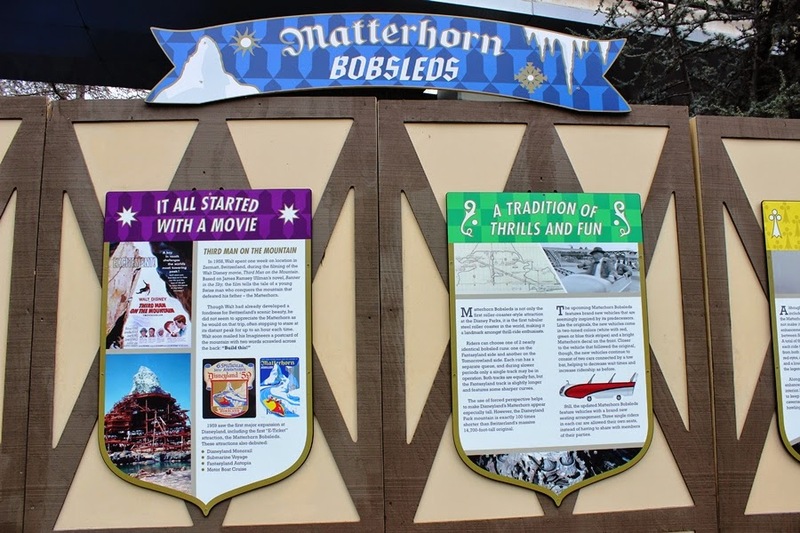 These signs not only provide trivia and history, but they engrain the guests into that history and provide a jumping off point for guests to become invested in the story of the park and to seek out other stories on their own. I will grant that each refurbishment and construction project is its own beast and must be examined through an entirely different lens. That doesn’t mean that there isn’t a way to incorporate this level of looking back into the work done at Walt Disney World. If the Vacation Kingdom is still watching the progress of its older sibling on the west coast, I think this is one time we seek to emulate that behavior and reap the rewards of renewed interest in Walt Disney World’s history when and where Disney can. We're living through the "re-targeting" of Disney - aiming at the younger visitors now. Although I don't get to either place often, there are still things I've enjoyed over the years that are now gone or a lot different. Seems they're aiming at shorter attention spans.